Disney confession time! 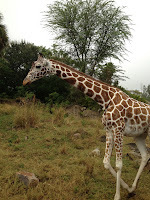 I did not go to Disney's Animal Kingdom, DAK, until my 3rd trip as an adult to Walt Disney World. My aunt is pretty high up at the Jacksonville, Florida Zoo, and as many times as people scream that "it's not a zoo", DAK is still pretty zoo-like to me. *Shrug* I enjoy the park, but it's more walking than Epcot, and it always feels hotter there than any other park. Don't get me wrong, it has it's high points which is where this Top 5 comes into play. 1. Kilimanjaro Safaris: This attraction gets you closer to the animals in a more free environment than any zoo can, and it allows you to see more animals in quick succession than at a zoo. You ride in a large safari jeep that takes you through a fairly long safari full of live animals. The guides are cheesy but hilarious, and the vehicles all have an easy to use animal guide. Photos from the safari are always impressive as the views you get are out of this world! I recommend going to the safari first thing in the morning as animals tend to come out more in the mornings, and the line is typically shorter. You can't go wrong with a Fast Pass here. Thanks to the spontaneity of animals, each time you ride will, of course, be different. One my last trip, the 2nd time we rode was the best safari I'd been on. A giraffe walked close enough that I could have touched it! 2. White Chocolate Elephant Cupcake: I've tried to stay away from Top 5 recommendations of very specific food or drink because I know we all have our own tastes, but this cupcake was one I'd been looking forward to for a very, very long time, and it was worth the wait! 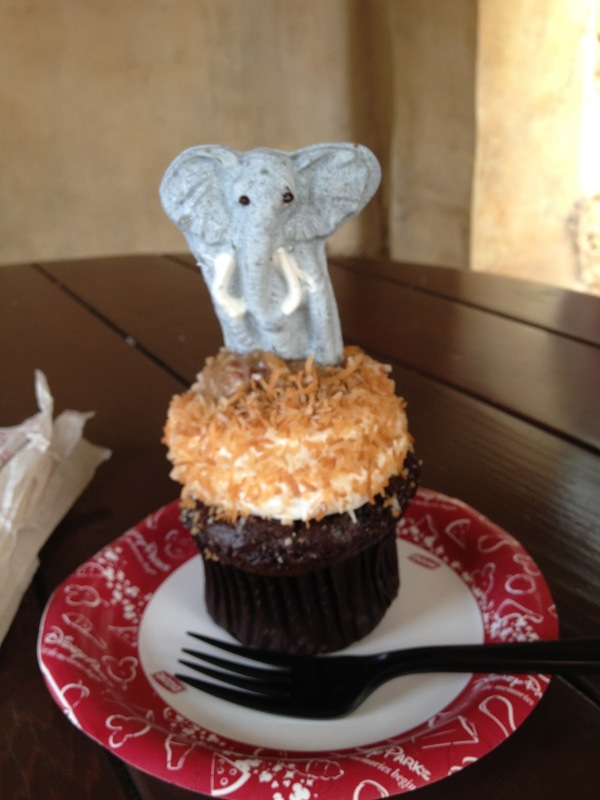 The cupcake can be found at the Kusafiri Bakery near the entrance to the Kilimanjaro Safari. While they didn't offer cupcakes at 10 am when I stopped by, the cast member was still able to get me one. The cupcake itself is chocolate with a mound of white icing coated in toasted coconut. In the middle of the icing is a glob of german chocolate icing (my favorite flavor in the world), and the whole thing is topped off by a large elephant sucker made of white chocolate! I loved this cupcake but couldn't eat the whole thing. It's a great snack to share. 3. Musicals: There are two large production musicals in DAK. One is The Festival of the Lion King which is more of a musical revue with live actors, singers, and acrobats with characters. I found that it didn't have much of a storyline, but it was still neat to see. It is not its Broadway counterpart, but it was air-conditioned and entertaining. The other musical is Finding Nemo which does follow the storyline of the movie but is much shorter. This one has brought tears to my eyes every time I've seen it. The entire musical is performed with puppets, but you can see the puppeteers. Oddly, you stop noticing the puppeteers and pay the most attention to the puppets. For the best view, I recommend sitting behind the break to the left of center when facing the stage. If you only have time for one of the two musicals, I preferred Nemo over Lion King. the stage. Large "floats" are brought in to the middle and between seating areas. 4. Flame Tree BBQ: A few years ago a friend recommended Flame Tree BBQ as a yummy quick service in the park. Now, I'm a Southern belle through and through, and I know my BBQ, so I was a little skeptical. One sniff near this place, and the delicious aromas put all question out my mind! The ribs were out of this world, and the portions are HUGE. Try sharing a meal here. Oh, and enjoy the wild birds while you eat (but don't feed them) as they flock around you. They get quite brazen in this area and will walk right up to you. I think my niece and nephew are still a little traumatized by a duck from this meal. 5. Half Day: I've had friends who tell me this is their family's favorite park; however, for me and mine, this is easily a half day park for us, even after we've ridden all of the attractions it offers. If you're looking for a park to fill a half day and then hop somewhere else, I recommend this one. Go early in the morning, take your time enjoying everything, grab lunch on the way out and maybe watch the parade, and then spend your evening elsewhere. Help me out, Disney veterans! Have I completely missed the amazingness of this park? Please tell my readers some suggestions for this park in the comments. The next post of this series will take you out of the parks with the last Top 5 list of the series. Sadly, I have not been to a Disney water park, so those will not make an appearance, but when I get back from my Disney Cruise in November I'll make sure to compile a "Must Do" list for DCL as well. DAK is one of my favourite parks and your list is spot on! (Though I might pick Lion King over Nemo hehe). Can't say I've tried one of those cup cakes but it is fast going on my list for the next trip! Looks delicious! I think DAK lacks as many attractions/shows as the other parks which is why people don't seem to 'gel' with it as much. I love it's laid back atmosphere, perfect for a more 'relaxed' theme park day! I love taking a stroll through the Pangani Forest Exploration and Maharajah Jungle Trek. They both are very relaxing "attractions" that you can just stroll through at your own pace. We experienced Festival of the Lion King for the first time last trip and LOVED it! The Finding Nemo Musical tops our must do list for next trip. We have never seen it! Saloca - You must try the cupcake! I've tried a few from Starring Rolls and other places, but nothing comes close to that one. I think I'd love DAK if I were a local. I'd have and take the time to stroll through it calmly, watching the various animals along the trails, but I never go when I have enough energy for it.